South Korea is poised to complete the installment of a US missile shield next week, officials said Friday, despite unabated controversy over the Moon Jae-in government’s flip-flopping on the timing of the deployment. The stationing of the remaining four launchers of the Terminal High Altitude Area Defense system comes as the Environment Ministry wraps up a small-scale environmental review. The equipment will join the already operational two launchers, radar and other assets to form a full-fledged battery. 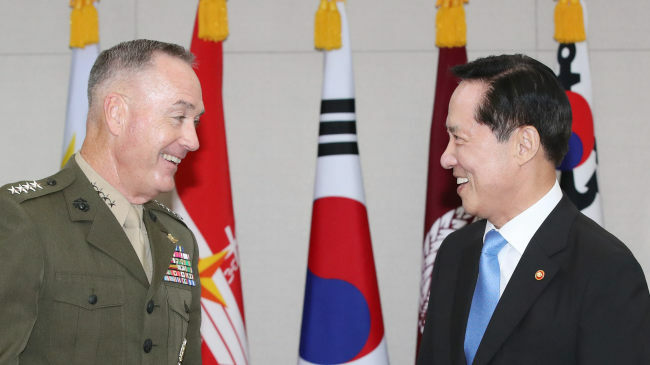 The move will also coincide with a maiden face-to-face meeting between South Korean Defense Minister Song Young-moo and US Secretary of Defense James Mattis, set for Wednesday in Washington. “Currently a small-scale environmental impact assessment is under way, and I can’t say it for certain, but the results are likely to come out around Monday,” a Cheong Wa Dae official told reporters on customary condition of anonymity. The Ministry of National Defense echoed the view, saying the four launchers and related apparatus will be brought to the site in Seongju, North Gyeongsang Province, as soon as the survey is finished. “The assessment is now in its final phase and we’re working to meet the Environment Ministry’s requests to supplement the process,” a Defense Ministry official told reporters, asking to remain anonymous due to the sensitivity of the matter and referring to tests of electromagnetic waves and fine dust. 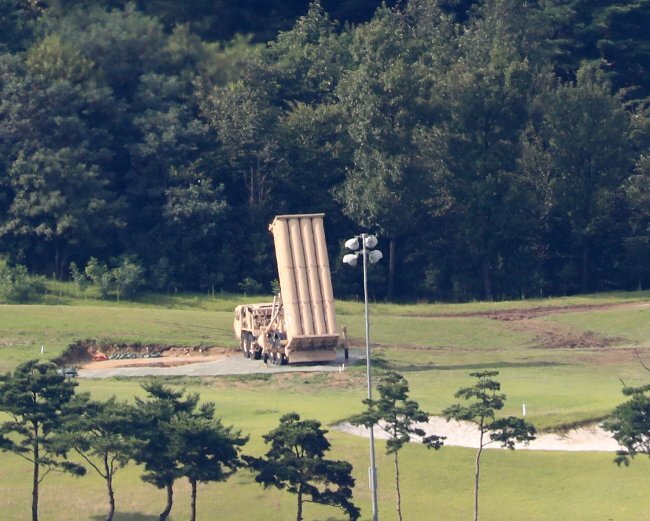 The official noted the issue of electromagnetic waves emitted by THAAD, which some lawmakers and activists have argued may be harmful to human health, would not postpone the deployment. The Defense Ministry carried out another electromagnetic waves check at three locations in the nearby city of Gimcheon early this week and found levels to be safe. It tested Seongju on Aug. 12 after a prior attempt crumbled due to the resistance of some residents. But the two officials refused to confirm Thursday’s remarks by the main opposition Liberty Korea Party’s Rep. Lee Cheol-woo, who chairs a parliamentary intelligence committee, that Prime Minister Lee Nak-yon is “bothering his mind” because of the Donald Trump administration’s demand for the four THAAD launchers to be put in place by Wednesday. The on-site analysis began about a month ago in line with Moon’s instruction to speed up the THAAD deployment shortly after North Korea test-fired a second intercontinental ballistic missile. The move marked a reversal of the fledgling leadership’s earlier decision to conduct a formal, comprehensive environmental review, which would delay the installment to at least late next year, triggering Washington’s discomfort and the opposition’s criticism at home. The swift deployment is expected to ease the burden for Song, who has a slew of sensitive items on the agenda other than North Korea’s evolving nuclear and missile threats. Among them are Moon’s pursuit to amend a bilateral accord to mount missiles with a warhead weighing 1 tons -- twice the current limit of 500 kilograms -- and build an atomic-powered submarine to better counter Pyongyang’s submarine-launched ballistic missiles. Song is scheduled to depart for Washington on Tuesday and also meet with Trump’s national security adviser H.R. McMaster on Wednesday. Following a three-day stay there, the minister will travel to Hawaii to visit the US Pacific Command and hold talks with Adm. Harry Harris, Pacific Fleet Commander Adm. Scott Swift and other key officials, another ministry official said. “The sides are still in consultation over the agenda for the ministerial talks but it would include the issues you could easily presume would be added,” the official said.